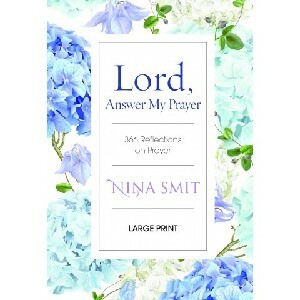 ~Nina Smit is one of the biggest and well-known names when it comes to daily devotionals in South Africa. Her writing is always popular and tops best-seller charts. With Lord, Answer My Prayer, month after month, readers will learn more about the subject of prayer as well as how to go about it. Nina draws inspiration from the Bible, from heroes of the faith like Joshua, David, Job and Jesus Himself to illustrate how powerful prayer can be. Topics include the role of the Holy Spirit in prayer, prayer in difficult times, prayer obstacles, how to pray for others and the joy of prayer. Each day opens with a Scripture verse and closes with an inspiring prayer.